4 Way Extends STM Versatility – Sellick Equipment Ltd. Deliver long loads through the tightest spaces with Sellick’s new STM55-4W. 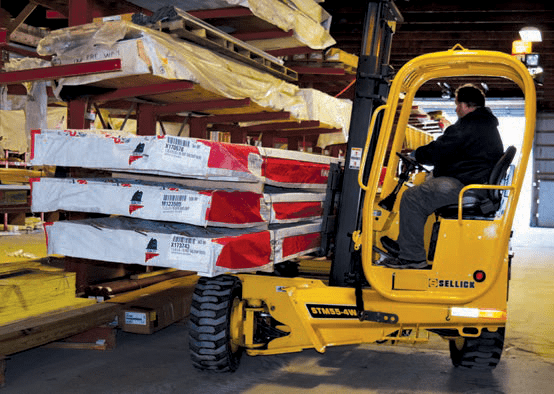 With the ability to become a multi-directional forklift in seconds, the STM55-4W can efficiently transport and place loads precisely where the customer needs it. A simple press of a switch, and it transitions from 4 way mode back to a traditional truck mounted forklift, easily mounted on the back of a truck or trailer equipped with a proper mounting kit. Easy step by step instructions are shown on the multifunction LCD display to provide guidance through the transition process. Additionally, on board diagnostics are displayed to enhance serviceability. Power is delivered by a 56 hp Kohler Tier 4 diesel engine that does not require diesel exhaust fluid or exhaust aftertreatment. Two stage mast heights range from 8 to 12 feet and can be equipped with optional pantograph reach for one side unloading and hydraulic fork positioning.